Enjoy restaurants and gatherings with your friends and family again with our hearing aid services. We will help you choose the hearing aids that are right for your lifestyle, your budget, and your individual needs. 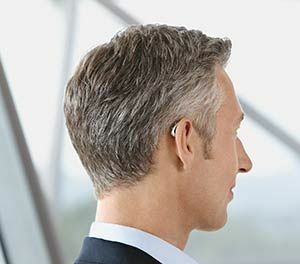 Mobile phone apps to control and to turn your hearing aids into Bluetooth receivers for hands-free calling. Over 20 years of service to Terrace and the Northwest! Entrust your hearing to the training and skills of an audiologist with a Master's Degree Audiology, a training program that develops knowledge and training in hearing science and rehabilitation. Terrace Hearing Clinic provides Audiology and hearing aid services to Terrace and surrounding areas in the Northwest. All of our evaluations, counseling, as well as prescribing and fitting hearing aids are with a Registered Audiologist. An audiologist has earned a Master’s Degree, six years of university training, including psychology, neuroscience, perception, acoustics (physics), aging, and of course hearing aid theory and functioning. An Audiologist uses that all of that knowledge and training to provide a diagnostic assessment and consultation for your hearing. An audiologist can also use that information and their own knowledge to provide an accurate hearing aid fitting and adjustments for your specific hearing needs. 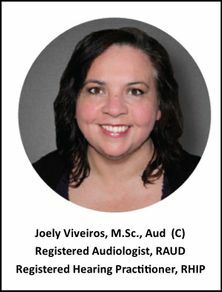 Our clinic Audiologist is Joely Viveiros, M.Sc., Aud (C), RAUD, RHIP. She graduated with a Master's degree in Audiology from the University of British Columbia's faculty of medicine in 1995. She has been providing hearing services and hearing aid fittings in the Northwest, specifically Terrace, Smithers, Rupert, and Hazelton and servicing kitimat residents for over two decades. Training is important, but so is experience. Our hearing aids are competitively priced (we strive for the most fair pricing), and we offer a range of prices to suit any budget. We provide services for many health plans and hearing aid plans. Most importantly, they are professionally fit, with ongoing follow-up and after-care. Hearing aids are not the entire answer for hearing loss, rather they are a tool used by a skilled and knowledgeable professional, working to get your hearing system functioning optimally for you. We will continue to care for your hearing after your hearing aids are fit to you, performing adjustments, and providing counseling to help you hear in the complicated and varied communication situations of life. We have all of the latest technologies available to you. No problem. We visit other communities as well. We have regular visits for a Prince Rupert hearing clinic, a Smithers hearing clinic, and a Hazelton hearing clinic based out of the local hospital or healthy living centre. Want us to visit your community? Have your health center contact us, and we can set up a visit. Appointments are available in Terrace Tuesday-Friday, and appointments for other communities are available Mondays. We are open in Terrace on Mondays for minor repairs, battery and supply pick up, and for scheduling appointments. Our friendly patient services coordinator can help you Monday through Friday in Terrace. Call us today! If you are simply curious about your hearing status, we can also perform a complimentary hearing screening. You can also take our online hearing quiz to find out whether you may have hearing loss. Learn more about our diagnostic tests.  Check us out on Facebook for the latest updates and offers from Terrace Hearing Clinic.